The movie Unplanned debuted a couple weeks ago. Prior the movie release, the air was filled with buzz and promotion including this blog space advertising it’s arrival with eager anticipation and expectation, encouraging all to see it. The day after the movie opened in our city, a group from the Deeper Still ministry went together to see the movie. I wasn’t able to go with my tribe that day due to a prior commitment but would have gone without hesitation. A couple days later I received a text from a post-abortive friend asking if I had seen the movie. She asked if she should go or if it would trigger her into a tailspin of emotions. It was at this moment that I came in touch with a reality unprocessed up until that point—how real and close to home this movie might hit me. What was once a non-negotiable determination drifted quite suddenly into a flight response. After debating, I determined the captivity of fear had conquered long enough. Taking up my courage (along with three very loving friends), I decided to go. Together we braved the theater– my husband on one side of me, and a dear friend and her husband on the other. To be truthful, it was hard—not the entire movie, but a few parts. There was one part in particular where I held onto my husband’s hand and my friend’s hand at the same time and sobbed. But when it was all said and done, I can wholeheartedly say I’m glad I saw it and plan to take my sixteen-year-old son this weekend at his request. This movie shows a truth that needs to be told. If you are post-abortive, yes, be aware this may and probably will trigger emotions in you. Possibly even bring emotions to the surface that have been buried deep for years or decades. But those emotions being felt and recognized are better than them being tucked away in a closet of your heart seeping out into your behaviors and interactions with others. It may feel safer to avoid and keep the pain inside, but long term it isn’t good or healthy. Emotional trauma has all matters of negative effects on the body (physically, emotionally, and/or mentally.) Abortion is an enormous physical, emotional, and spiritual trauma. I believe the Holy Spirit will meet you in your place of greatest need. If you have had an abortion, He will meet you in this movie and begin the healing journey. Or if you’d had some healing, take you deeper in healing. Deeper Still is a ministry that holds healing retreats for women who have had abortions and the men who fathered those children who were aborted. Our retreats are free of charge and if you are in need of healing from an abortion, we’d love to walk with you during this healing journey. The Lord is full of mercy and compassion and fully wants His sons and daughters healed and set free. This movie is setting in motion an awareness of the need for healing. Sometimes the wounds of our hearts have become a thorn we have grown accustomed to living with, leaving us unaware to the devastating impact on our lives. The Holy Spirit will at the proper time allow pain to surface beyond what we had become use to enduring, as an indicator of the need for healing. Perhaps the Holy Spirit has brought pain to the surface through seeing the movie Unplanned or even just this blogpost. Whatever the catalyst, the Lord doesn’t waste our pain, nor does He despise it. He is very much in tune to our pain and His aim and desire is always to heal. Please go to www.GoDeeperStill.org today to find out about our healing retreats in various parts of the country in April. Also, a good place to start finding healing until you can attend a retreat is through Karen Ellison’s book, Healing the Hurt that Won’t Heal, available on the Deeper Still website or Amazon. We want you to find healing, but more importantly the Lord Jesus wants you healed and set free from the bondages of sin and captivity. May each person in need of healing find it. The Lord will meet you in your greatest need in a way greater than you could ever have expected. His love for you is beyond compare. He is calling. Father, we thank you that you comfort your people and have mercy on the afflicted. Father, bring healing to the parts of my heart that need your loving care and give mercy in my greatest need. Bring understanding and enlighten my awareness of your love, even in the darkest places. In Jesus’ Name, Amen. 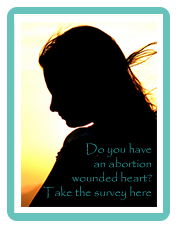 Do you have an abortion wounded heart?